Mahatma Gandhi’s dream of India was not only of a politically independent country but also of a clean and developed country. Its our duty to clean up and serve Mother India. So children of our school felt the responsibility, and decided to start this first, by doing it themselves, for their family, for their school, their locality and for their city. They know that this one step towards cleanliness would help to make their country clean. 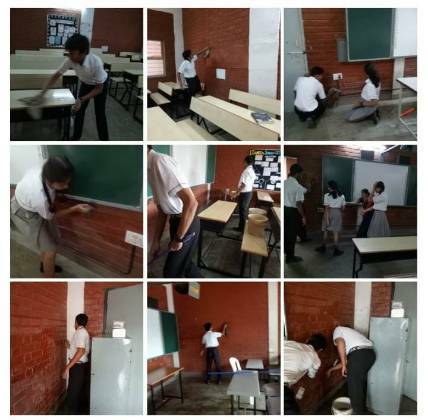 As a part of this programme, students of grade X comprising of 63 children volunteered to clean the whole campus including the class rooms on 01/09/2018. 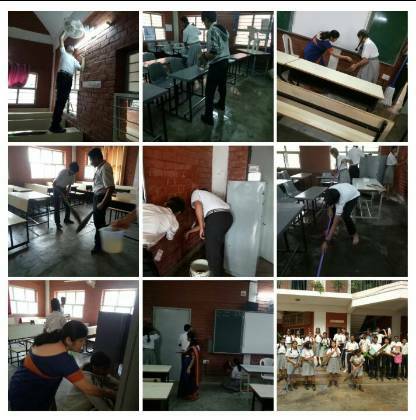 The students participated with much enthusiasm and zeal and pledged that they would follow the Swachh Bharath Abhiyan introduced by our great Prime Minister Mr. Narendra Modi. Keep your city clean and green, for the future generation to be seen! Clean India is a choice, make it one voice! Be keen to be clean! Plastic plastic go away, I want my earth to play! Plastic products harm our life, leave it; or else it would work as a knife! East and West, cleanliness is the best! If you dream, India will be clean! If you litter, the city won’t glitter! Clean India, Green India is my dream India.